It's been a while now since we escaped barbarian hordes, fled across the country and founded our shiny new village in Above and Below. We've clearly gotten tired of exploring the cavernous world of Below, because it's time to set out into the big wide world on a brand new adventure. Legends tell of the Last Ruin, a hidden city far away across the wastes of Arzium where we'll apparently find an artifact that will grant our hearts' desires. Let the quest for the Voucher of Infinite Jaffa Cake Supply begin! 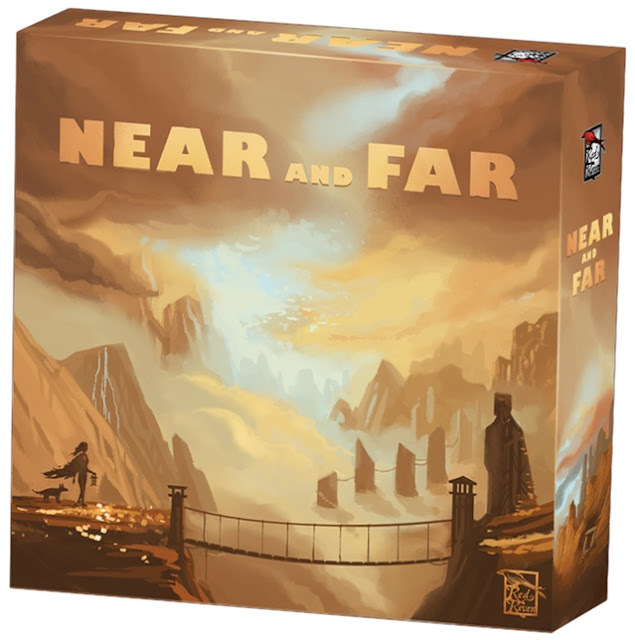 Near and Far is an adventure game for two to four players set in the same world as Red Raven Games' adorable Above and Below. Building on the storytelling elements of its predecessor, sequel Near and Far is described in the rule book as an 'atlas' game, where your quests take you across a series of maps from a book that replace a standard game board. It also incorporates elements of card drafting, worker placement and a little dose of luck with dice roll skill tests as you split your time between preparing for travel in town and wandering the land on your journey. First adventure: an introductory game with basic rules to help you get a feel for the game. Campaign mode: play through a series of ten maps whilst developing your character with experience points, talents and side quests that carry over from game to game. Arcade mode: for quick, one-off games, where you use little arcade cards instead of reading quests. Character mode: play through a selection of maps using the character-specific quests to tell one of eight unique stories. On first reading the amount of ways you could play the game, I had an unreasonable panic and shut the rulebook for a long time. It turned out that everything really was a lot more straightforward than I'd built it up to be, though, and I wish it hadn't put me off for so long. The basic rules are mostly the same across modes, with differences being clearly highlighted in big, friendly looking boxes throughout the book. Once you've played one mode, it's just a case of a few tweaks to try out one of the others. Having chosen how you're going to play, setting up the game is simply a case of following the step-by-step instructions laid out methodically in the rulebook. I've loved every Red Raven Games rulebook I've seen to date, as they've all been really well organised and illustrated to make your first games as smooth as possible. From clear iconography to well labelled diagrams, everything feels helpful and considered. Near and Far is no exception, despite being a good deal heftier than any of the others I've read previously - but we do have a big adventure to cover! Whilst searching for the Last Ruin you'll be gathering Journey Points for doing various adventure-type things, and the player with the most Journey Points at the end of a game is the winner. The game ends when a player runs out of 'camps', represented by teeny little wooden tents that you can scatter liberally across the map on your travels. As part of setup, you'll do a little bit of card drafting to select artifact cards to start the game with. These do lots of helpful things throughout the game and are worth Journey Points, but will cost you resources to buy. Any artifact cards left unpurchased in your hand at the end of the game are worth negative points, so they definitely give you something else to think about! With setup complete and cards chosen, it's time to begin. Every good role-playing game starts off in a town, MacGuffins you into an adventuring party (usually in some kind of drinking establishment), kits you out in shiny new gear and then ships everyone off into the big wide world quicker than you can say 'critical failure'. Near and Far follows this time-honoured tradition, offering players a town board where they can recruit allies and stock up on supplies before heading out on the road. Each turn, players have the choice of two options: 'visit town' or 'adventure', which means you can come back at any time during the game to rest and regroup. All of your trading is done here. The main currencies of the game are food, gold, gems and faction tokens in four colours, and this is where you can swap them about or bribe some dodgy officials to adjust your reputation. I will always wish this spot was called 'tavern', I can't help it. This is where you can recruit new adventurers to your party and add them to your player board. Each new recruit brings something extra to the party, adding additional points of skill, combat, movement, caution or search to the team as indicated on their token. They also bring additional hearts, which will add to your heart total when you leave town. Hearts are needed to move around the map and build camps, so the more the better! And I completely forgot to say that you start with an adorable pet, so you're never adventuring alone! Here you can buy pack birds, which are very clearly adorable, but also hold one treasure card each. In 'advanced town' mode you can even have a pack tortoise - as if things couldn't get cuter. This is where you can pick up said treasure cards. These give players special abilities or extra Journey Points. Gain a number of food tokens equivalent to your skill level. Place camps here to gain rewards of gold and gems. For most of these buildings, only one player can occupy them at once. If someone wants to visit a building already being used by another player, they have to duel for it. To duel, each player rolls a die and adds any combat modifiers they have available. The active player can choose to 'fight dirty' to gain a bonus to their roll, but this will also cost them a reputation point if they win. If they fight honourably and don't take the bonus, this will gain them a reputation point instead. If they lose, however, they get put into 'jail' and effectively miss a turn, neither gaining nor losing reputation. This isn't my favourite mechanism ever, as there have been a few times where I've found myself really needing to go to one spot and ending up taking an extra turn to get there because of a rubbish die roll. I'm sure this is down to my own poor planning somehow, but it felt a little jarring with the rest of the game and risked turning any player interaction outside of quest reading into a bit of a passive-aggressive-standing-in-the-way competition. Yes, that's a thing. Of course, whilst your turns are ticking away in town as you're making sure you've herded enough giant kiwi, cancelled the milk, packed enough food and turned the oven off, the other players could all be merrily disappearing off on their adventures. This is an interesting balancing act to figure out, because the longer you spend in town, the further everyone else will be getting in exploring the map. When you choose to leave town, you'll count up your starting hearts as shown on your active party members, adjust the tracker accordingly and start moving around the map. It costs you one heart for each empty space you pass, so your first adventure isn't going to take you far. This is especially true as you're also limited by your movement stat, which has a base value of 2 but increases with the movement symbols shown on pack birds and party members acquired during the game. As people start to move around a bit and place their camps, there are fewer empty spaces to worry about and moving becomes a lot cheaper in terms of heart cost. Hang around in town long enough and you might find yourself skipping merrily across a map that someone has neatly filled up with camps for you, taking you straight to that shiny quest space you wanted. Of course this could also leave you behind in setting up your own tents, so deciding what to focus on always gives you interesting choices to make when taking your actions. Out in the big wide world you'll also find dangerous threats to deal with, treasure to find and quests to complete. The quests are my favourite bit! Quests can chain together, with rewards sometimes including the reference number for a different side-quest, or perhaps you'll gain a 'keyword' that will have a consequence in future quests. (This can come a little unstuck if there's the odd error or two in the quest text, however - check out the BGG errata here https://boardgamegeek.com/thread/1789431/errata). Anything you need to remember can be noted on the handy character sheets provided and used for future reference. We played the game mostly in campaign mode, but the character mode stories are well worth a visit. The fact that each of the eight characters have their own story makes it really special, and the game even comes with suggestions of which ones you should pick at low player counts to get the most out of your adventure. The purpose of arcade mode is a bit mystifying to me, as the rulebook suggests this is a good way to play for people who want a quick game and don't fancy reading, or have read the quests too many times to find them interesting. Personally I find the quests are one of the funnest parts of the game, and I can't ever see getting to a point where that's not the case. This could be because Near and Far is more of an 'occasional' game for me rather than a game that would hit the table every week, so I probably won't run out of replayability in the same way as someone who puts in the hours all at once. It's lovely that Red Raven Games have tried to cater for everyone, though, and I can see that using the shorter cards could help to decrease some of the language dependency in the game for anyone who would struggle with big blocks of text. Near and Far has been a very happy experience for us. It may not be the most mechanically complicated or challenging game out there, but it does deliver on what it promises from the moment you open that beautiful map book: an adventure. It's not all sunshine and rainbows - the quests can sometimes feel a bit few and far between in the same way as Above and Below so that you always want to do more, and I don't love the duelling mechanic - but it has the same original, refreshing feeling that I've found with other Red Raven Games before. In an increasingly crowded marketplace I'm so pleased that there is still space for games that can just tell an interesting story and focus on giving the players a memorable experience. These are the games that will stay with me for longest. Just like Above and Below, the world painted by Near and Far is charming, whimsical and beautifully inclusive. Thoughtfulness and consideration is everywhere throughout the game, from the components to the artwork to the rules. I know this is the case nowadays with most games - designers and publishers have no choice but to put their heart and soul into the products they make - but it seems to radiate from this game, somehow. I can just see the writer smiling to themselves when they describe how to use Near and Far adventurer tokens in Above and Below (because you can, by the way), where a player gets points at the end of the game for each set of bacon and bread symbols on their tokens, because that makes a bacon sandwich. I feel the nostalgia and history of including a little section on the very first map showing your old home village of Above and the caves of Below, just to blow your mind about the scale of the new game's journey. These little touches go that one step further to make the game feel loved, and I really appreciate that as a differentiating factor. With the Amber Mines expansion due out soon, this is definitely going to see more play over the coming months! Let me know if you've tried Near and Far yourself, and what you thought of it. Thanks to Asmodee UK for providing me with a copy of the game to review.